The circuits presented today allow the control of a LCD display that has a very common chip to be controlled by a micro-controller HD44780 or one that is compatible with this one. 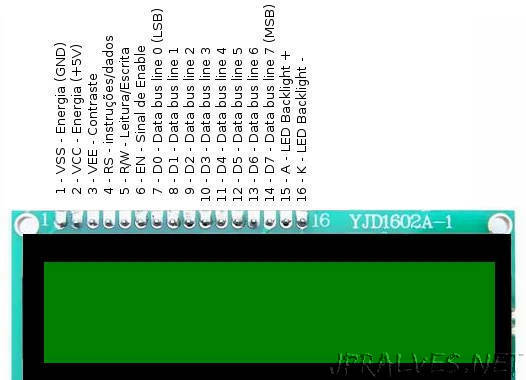 There are several formats for this LCD, however the most used is the 16x2 (16 columns with 2 lines). There are also several colors for the LCDs. Being an LCD display that receives the information that will present in serial format, this uses a very significant number of pins of a micro-controller. Set RS and D0-D7 to the desired values. It is necessary to ensure that there is a timing of about 37 usec between the described operations. The first uses the 8 data pins and the second only 4 of them (D4 to D7). In the circuits presented we will use the 4-bit mode using 6 pins (4 pins for the data, one for the Enable and another for the Instruction type). This saves 4 pins (D0 to D3 are not used) and the data is sent in two steps (two nibbles). The HD44780 supports a set of commands that are documented in its datasheet, however as we will use a library it is not necessary to know in detail these Commands. To decrease the number of pins used we will implement the communication via I2C or TWI. The second circuit presented has an Integrated - PCF8574 - which implements the I2C interface and allows the sending of commands to the HD44780 via this protocol. This uses only 2 pins of the I2C protocol (SDA, SCL) plus the 5V and GND. In this circuit we will use 6 of the 8 pins that the PCF8574 makes available to us. The same 6 that were needed in the first circuit. When we are using an Integrated I2C it allows you to configure the address by pins. 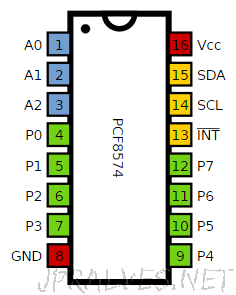 The PCF8574 has 3 pins for this purpose A0 to A2. These must be connected to GND or 5V (with a pull-up) to set the desired address. In our case they were all connected to GND. It gets integrated with the address 0x20. As shown on Malpartida’s site, the performance of the I2C interface is much lower than having the HD44780 directly connected to the AVR, but when it is intended porpuse is just showing information the pin savings may be required. 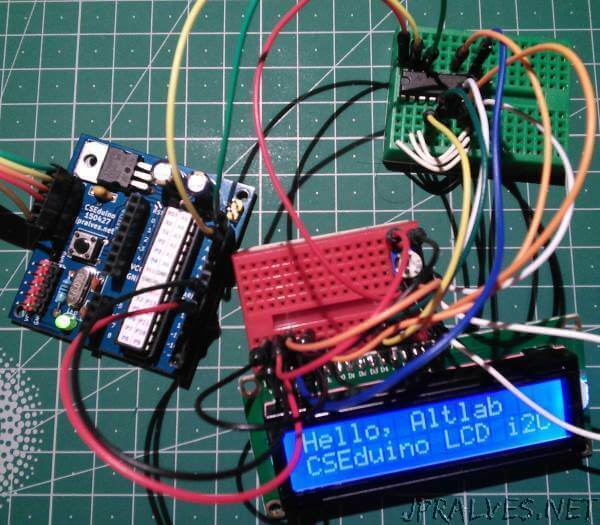 The code shown uses an external library that can be downloaded from this link, or locally on this link and it has to be installed in the Arduino IDE. This library replaces the Arduino library including support for I2C communication among other things. //Sketch uses 4,048 bytes (12%) of program storage space. Maximum is 32,256 bytes. // Global variables use 327 bytes (15%) of dynamic memory, leaving 1,721 bytes for local variables. Maximum is 2,048 bytes. // Sketch uses 4,784 bytes (14%) of program storage space. Maximum is 32,256 bytes. // Global variables use 374 bytes (18%) of dynamic memory, leaving 1,674 bytes for local variables. Maximum is 2,048 bytes.